A Waveshare 5Mp Raspberry Pi camera module with a OV5647 CMOS sensor was mounted in a project box and a connector was used to connect the short ribbon cable from the camera, to a 1m ribbon cable from the Raspberry Pi 3 running Ubunto MATE Linux. The camera was placed at the prime focus of a Skymax 127 Maksutov mounted on an EQ mount. 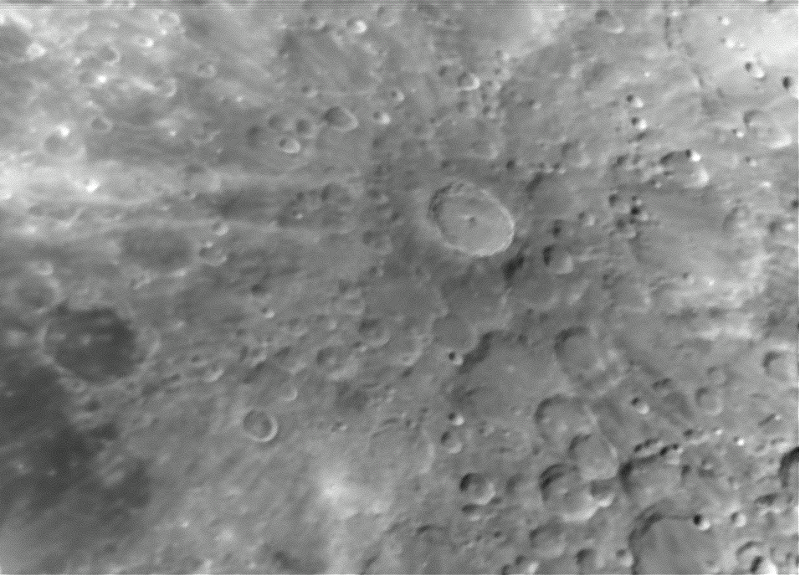 Using Python 3 software that I have written to capture .bmp images, I captured 100 .bmp images at 1024 x 768 resolution, of the Tycho region of the Moon. The images were registered and stacked in the Linux application lxnstack. The resulting image was wavelet processed in Registax 6 running in Wine via Exagear, and post processed in the Gimp, all on the Raspberry Pi. The wavelet processing was the only part of the process that ran slowly.